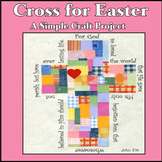 Children will love this wholesome art lesson inspired by the Bible (John 3:16). Students will learn key elements of art theory while celebrating their Christian faith. This project is perfect for Religion Teachers, Art Teachers, Sunday School Teachers, Child Care Centers and Home School Families. 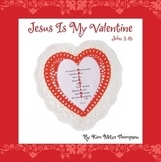 Bible Handout - John 3:16 (NKJV) Handout - Print & Go! This fill in the blank/coloring handout is a wonderful way for your students to learn John 3:16. I recommend using colored pencils. Bible Verse of the Week-John 3:16. 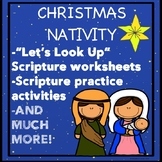 Printable Bible Study Curriculum. 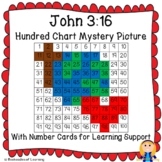 Dotted letters for your students to trace the passage John 3:16. Specific letters in the passage spell out valentine. Explain to the students how Jesus showed the greatest love by dying on the cross for us. A beautiful verse in a beautiful script ready for you to print out and display. 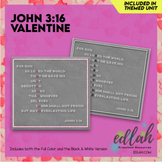 Bible Verse Bulletin Board Set - John 3:16. Print and Hang! 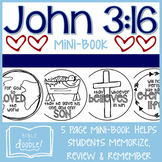 Free Stationery with John 3:16- ABC's of salvation lesson! This poster of John 3:16 includes a fill in the black option for helping your students to memorize this verse.